After celebrating an impactful theatrical run and embracing the stories of change heard nationwide, HOME RUN is set to continue sharing the message that “freedom is possible” with its release to DVD and Blu-ray today, July 23. The Millennium Entertainment and Provident Films DVD and Blu-ray release will be available initially only at Walmart and Christian retail stores while site licenses for screenings of HOME RUN at churches and non-profit organizations are currently on sale. The film will also be available for digital download and VOD on August 27. Declared as a film that “reminds us of the power of forgiveness, the richness of redemption, and the wisdom of trusting God to revive us” by Max Lucado, New York Times best-selling author and pastor, the impact of HOME RUN has fostered grassroots support from churches, Celebrate Recovery groups, Christian leaders and more across the country. 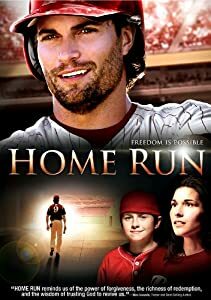 HOME RUN is a well written powerful story about a baseball player named Cory Brand who had many challenges as a young boy growing up with a difficult father. He took those feelings of abandonment and disappointment into his adult life which led him to make choices which were not the best for him or his career. Meeting the right people while coaching a little league baseball team in his home town helped him to learn to forgive, trust in God, and acknowledge his abuse of alcohol. He was able to then move on in his life which brought him love, acceptance, redemption, and hope. It is a family movie but I am not sure young children will understand the major theme. I think watching it with older children, middle school and high school children could lead to a family discussion about the theme of the movie and the choices we make and consequences they have in our lives. I feel it is a movie worth watching. It definitely has application to our lives today.